This was definitely a case of judging a book by its cover. Although I’ve devoured a number of Bryson’s other books, the title and topic of this one just didn’t appeal to me. But when a thumbed copy turned up in my household, I decided to have a read of the first couple of pages, and found myself only putting it down again half-way through. 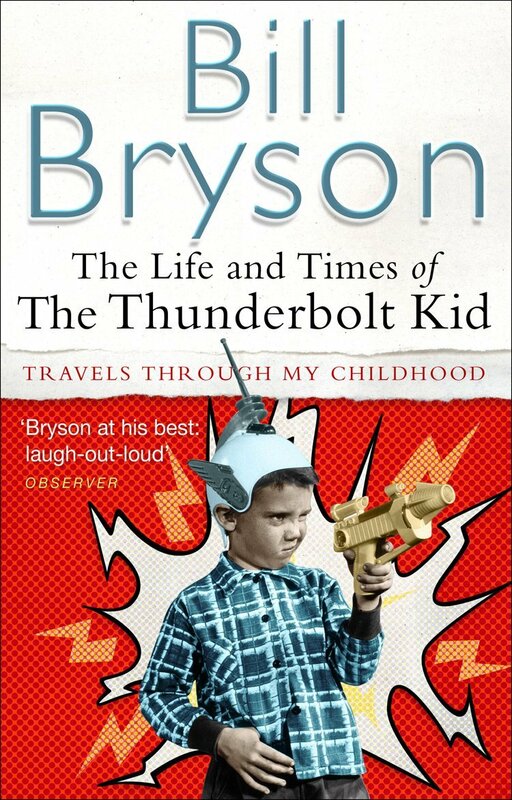 Part-memoir, part-history of a mid-western US state in the 1950s, The Life and Times of the Thunderbolt Kid is a humourous look at Bryson’s early life growing up in Des Moines, Iowa. There are dozens of amusing anecdotes about the vagaries of his family, his school and home life, his holidays, and his unending quest to catch a bit of ‘female epidermis’ in the flesh. The memories of his own life are interspersed with more general comments on the changes going on in America, with talk of economic growth, changing social mores, anti-Communist witchhunts, racism and the space race. Certainly, some of the things Bryson mentions happens before he was born, or the changes run on long in the 1960s, but it’s still interesting to see a take on life in this baby boomer generation. Whilst there’s a lot here that’s surely unique to the America of the 50s, there’s enough that is so simplistically human that I think most people will find passages reminiscent of their own trials and tribulations of youth. Ironically, despite being born a few decades later, I felt that a lot of the developments Bryson talks about in 1950s American society were the same ones I experienced as a child in rural England! All of this is delivered in Bryson’s typical affable and humourous style, which if you’re a fan, you’re sure to lap up. Some readers have quite justifiably complained that Bryson’s reliance on hyperbole and silliness to sweeten his anecdotes is a bit tiring, and makes it at times difficult to separate truth from fiction, but that’s simply his style. I’ve always been inclined to link Bryson with Wodehouse in the way he wrote slapstick humour, and felt vindicated to read that he had readily gobbled up Wodehouse as a child. For me, this is classic Bryson. Some have pointed out that Bryson’s labelling as a travel writer is going to have change with the latest additions to his oeuvre. But for me, he was never a travel writer, but a writer who travelled. After all, anyone attempting to travel across a continent armed only with the appropriate Bryson volume was merely arming themselves for a few giggly embarrassing moments on public transportation, nothing more. There are certainly enough laugh-out-loud moments here, and plenty of smiles in between, that you wonder sometimes it doesn’t come with a warning sticker on the front. That said, one criticism that I must agree with is the book’s design. There are quite a few pictures in the book, including some family photos, which are sadly captionless and only breezily explained in the footnotes at the back. The typeset is rather widely spaced, which whilst making it easier on the eyes, is just an excuse at padding. There’s also a preview chapter from Neither Here, Nor There: Travels in Europe taking up space at the back, which makes this book despite its heightened page count one of Bryson’s shorter volumes. Ultimately, this is a book for established Bryson fans. It isn’t as well written as the best of his travelogues, and in terms of being informative, there isn’t much here that isn’t already widely known, but for a bit of light, nostalgic reading that is sure to put a smile on your face, it easily fits the bill.